And that marks the end of our live Premier League coverage on these pages for the day. You can read Tim Oscroft's match report here, catch up with the day's action here and follow Athletic Bilbao v Barcelona here. Also I heard there's some boxing going on tonight? You might want to follow that with us too. Here's a reminder of tonight's Match of the Day running order. 10:30 BST. BBC One. Don't miss it. More from Chelsea manager Antonio Conte. On the performance of goal scorer Eden Hazard, the Italian said: "Eden needs to be involved in our football because this type of player wants to play, but it is important to try different situations. I think he played a good game and the team are playing very well together. Now it's important to rest and prepare for the game with Roma in the Champions League. Bournemouth manager Eddie Howe: "We were resilient, but too passive in the first-half. We had to change things and we did. We are disappointed with the goal, but didn't quite have the quality we needed. "I don't think we hurt them, we didn't stretch their back five and a poor touch here and there stopped us. There were positives from the second-half, not the first, you have to give Chelsea a lot of credit for that." On Bournemouth's results this season: "It's a worry not going to hide fom that fact. I think we have a run of games where we have to do that [win]. I think you need to have a good run during the season, it'll make a huge difference, we're prepared. On the injuries to Benik Afobe and Junior Stanislas: "Junior looks like he has done something to his groin but with Benik we're not sure yet." This is how the top of the table is looking after 10 games. Eden Hazard quite rightly isn't ruling out catching Manchester City but their five-point lead over the rest already looks a big one. Chelsea goalscorer Eden Hazard: "[It was a] very good goal, important also. When you play this kind of game you just need to win. "We created a lot of chances...we didn't score, that's the problem, but we have three points and we move on. "I think Thibaut [Courtois] needed this [result] for the confidence, but I think all the team deserve this, we did well defensively, offensively also." On if Chelsea can catch leaders Man City: "The season is long, you never know what can happen. They are top and play well with a lot of goals...but we have a lot of games to play, we will see at the end of the season." "I like to play against Bournemouth! I try to play every game like this. I scored, we won, so I'm happy." It was his fifth in five games against the Cherries. Here the goal is in graphical form. Eddie Howe says a "key spell" of his side's season is coming up now following this evening's defeat. His side are 19th in the Premier League table. 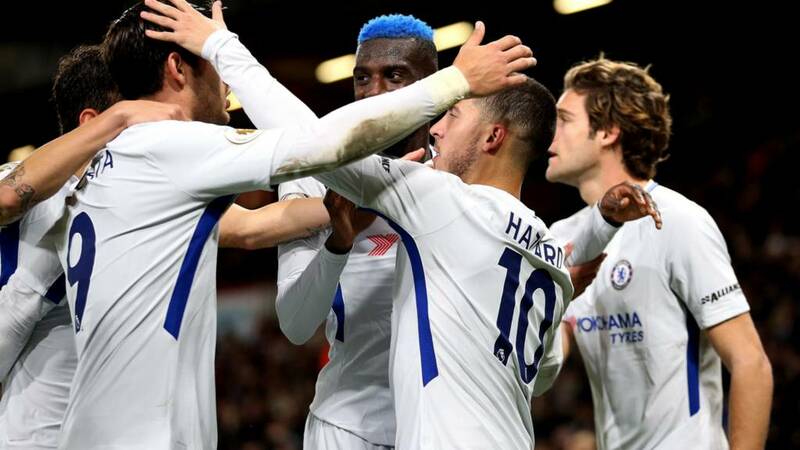 Chelsea will look back on a deserved win, albeit one without the two or three-goal margin of their last three games against the Cherries - and hope a professional performance can quash the midweek speculation that all is not well behind the scenes at Stamford Bridge. Or at least, keep it off the back pages for another few weeks. Bournemouth's fans would have regarded anything they got today as a bonus - their players and manager are warmly applauded off by the home supporters, not something you might expect at a Premier League side who remain in the bottom three with only two league wins all season. As David Pleat says, they can be proud of that display. Seven games. Plenty of goals. Who's first on Match of the Day tonight? Gary Lineker is live on Facebook right now to let you know. I'm with you there King Mo. Whenever Bournemouth did press forward, Cesar Azpilicueta was there. Donald: Maybe Fabregas would have done better today were the thought of Matic taking him back to the bench still potent. Yullaw: Shame Willian doesn't start for Chelsea! Mark my words, he's better than Neymar! King Mo: Cesar Azpilicueta is a Man of the match contender. Conte also gives Nathan Ake a big hug as he heads off down the tunnel. The young Bournemouth defender, signed from Chelsea in the summer, did himself no harm today. Conte suggested pre-match the decision to sell the Netherlands international was not his so there may be a bit of sentiment in that embrace. Antonio Conte gets an excellent reception as he walks over to applaud the Chelsea fans. It has been a difficult week for the Italian, forced to answer questions on his future but his side are back up to fourth in the table. Bournemouth just didn't have enough craft in the final third to get the goal but they stood firm throughout. Hazard has been the star but there is a lot of quality in the Chelsea team. Morata had a great chance and couldn't convert it. Chelsea will be pleased with the three points. Bournemouth came up short but they can be proud of themselves. Eden Hazard appears from the Chelsea bench to shake hands with all of his teammates and the Bournemouth players. As I said earlier, he was the difference. Clinical, professional, unspectacular from Chelsea but three important points. You always get one chance and I fear for Bournemouth this was it. It is really well-worked on the edge of the box and ends with a powerful Steve Cook shot. It's Bournemouth's first on target all game but not good enough to beat Thibaut Courtois. Four minutes have been added on. As David Pleat says, Bournemouth have been decent without really creating. They have about three minutes more to do so.